Judith Clancy is the author of “Exploring Kyoto — on Foot in the Ancient Capital,” published by Stone Bridge Press, Berkeley, a guide book which allows the reader to experience the city's leisurely tempo while visiting some of its magnificent sights. Her first publication was “Naturescapes,” a book dedicated to her ikebana teacher, Suiko Tamura, which traces the Buddhist and Shinto influences on his works. She has lived in Kyoto since 1970, and her interest in the traditions of the ancient capital has led her to study and write about traditional music, the tea ceremony, and Ikebana. While acting as the guide and interpreter for various groups, she established ties with many dedicated traditional artists and teachers. On a crisp, clear day in January 1970, I came to Japan and never left. 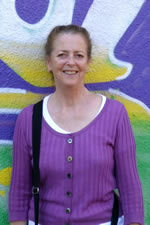 Two years of paramedical work in South Korea as a Peace Corps volunteer gave me the chance to travel. While walking the streets of Kyoto, I saw well tended gardens in homes and in temples, abloom with camellias and full green leafy trees — in mid-winter. The Kamo River was speckled with snow white wintering gulls and native egrets, and the occasional turquoise-colored kingfisher. I became enchanted with the life of the city and knew I wanted to live here. It has been an affair of the heart for almost twenty-eight years and like all relationships, it has had its ups and downs, but there are moments in each day that are so pleasing, that I cannot imagine life anywhere else. The seeds for “Exploring Kyoto” were sown one night at a dinner party, and grew into an attempt to better understand Japanese people, history and traditions. A few months earlier, I had joined a bird-watching group that met once a month in the park surrounding the old imperial palace. All the other members were Japanese, and directions to move to another bird-spotting place were stated in terms of going to so-and-so’s “estate.” However, there were no structures in these places, just a greater variety of trees and shrubs than seen on the wide gravel promenades that surround the inner palace. Eventually, curiosity overcame my embarrassment, and I asked why these places were referred to as estates. One man patiently explained that these were the remains of estates, not extant ones. “Ah,” was all I managed to say, still no wiser than before. Explanations were given at many sites, but they were all in Japanese. It took a lot of study as I searched through books and translated signs. The estates we were wandering through, I discovered, were once the grand residences and gardens of members of the imperial court, and another wonderful bit of the city’s history was opened up to me. Few signs in English mark the city’s historic sites, and the ones that do are so filled with the dates of battles, fires, and reconstructions, I felt that they contained little meaningful information. In addition to its offering some of the world's most beautiful temples and Buddhist sculpture, Kyoto is one of Japan’s greenest cities. Flowers bloom year round and a large variety of birds (plains, river, sea, marsh, and woodland species) can be seen. Kyoto is Japan’s favorite sightseeing city — its beautiful natural setting, its gardens, temples, festivals, ateliers, and crafts offer a year-round feast of color and life. Exploring its mountain paths or treading its centuries-old streets is a visual delight. 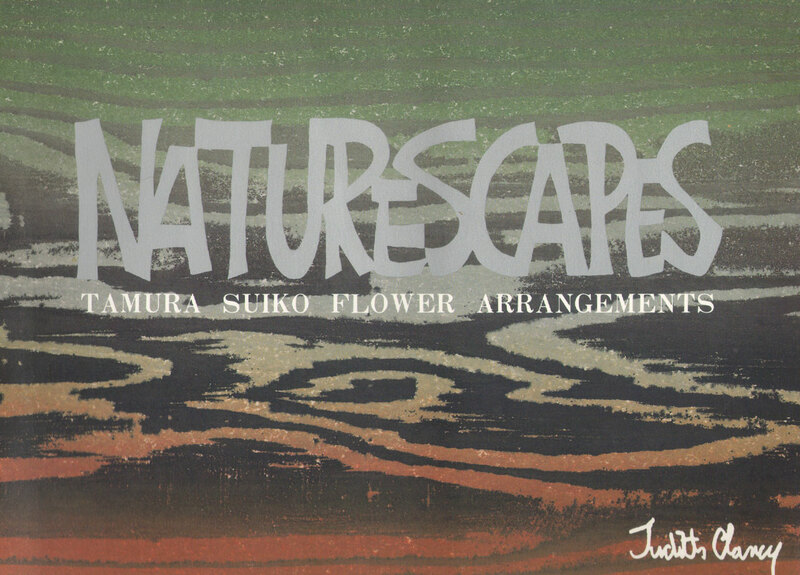 Above: book cover of “Naturescapes,” a book dedicated to Clancy’s ikebana teacher, Suiko Tamura. Copies available from the author.